There’s nothing sweeter than the sound of children laughing. For me, it triggers memories of the carefree days when my schedule wasn’t overbooked and there were no bills to pay. When my biggest decision was what kind of ice cream treat I should buy from the ice cream truck that frequented my neighborhood on the endless hot summer days. Recently I read a study on the benefits of laughter. Some people refer to laughing as “internal jogging,” because a good hearty laugh gets your blood circulation flowing and can produce a cardio-like workout. Of course, you’re not going to burn the calories you would by hitting the gym, but laughter is relaxing and can decrease your blood pressure. After reading, I concluded, laughter is the best medicine. Have you ever tried to laugh and be anxious at the same time? Proverb 17:22 A cheerful heart is good medicine, but a broken spirit saps a person’s strength. I believe laughter is a special tool, gifted to us by God, to lift our spirits and to diminish our worry. It’s a way to express our inner joy to the world. My hope is that each day we’ll choose to laugh on purpose. Of course, there will be days when we feel there’s nothing to laugh about, but we can always laugh as we trust God to take care of our situation. Speaking of laughter…I’d love to hear something that’s made you laugh recently. Hi Jill. It’s nice to finally read your post. You usually beat me with comments every morning and I get to read yours before writing mine. So today I feel like it’s my day to greet you good morning and thank you for sharing. I have a feeling we may have read the same study about laugher… which makes sense since I’m also a Psychologist and I do like to read about happiness now and then (not my research area, but one of those topics I feel pulled to read). Hi Priscila! It’s nice to meet a fellow early bird and Psychologist. I studied Psychology in college so I’m always interested in reading studies such as these, as well on human motivation. Thanks for the early morning greeting. I hope you have a great weekend. What a great story. Ah…the first day of high school…that’s certainly a stressful time. What a great way to start the year, with the sound of laughter. Thanks for sharing. So far, my day has been full of laughter. I hope yours is too. Enjoy the weekend! Jill—Thanks for the reminder. I’m fortunate that I have people in my laugh that make me laugh. :) Ha! No, seriously, I love being in the kind of mood where laughter just happens. It is good for the soul. Like you, I’m blessed to have people in my life who make me laugh every day. And on most days, I make myself laugh too. 😊 Have a great weekend, Lindy! I’m a big fan of what a lot of people call “dad jokes.” My current amusement is this: did you hear the joke about the wall? I’m still trying to get over it. LOL! That’s great, Elizabeth. Thanks for making me laugh. My husband has always enjoyed the verse a cheerful heart does good like a medicine from Proverbs. He enjoys making children laugh. I laughed when I read your post as it reminded me of my husband. I’m happy my post made you think of your husband. He sounds like a wonderful man. There’s something magical about the sound of children laughing. Enjoy your weekend! There’s nothing better than a good belly laugh, is there? Your comment reminded me of my sister. Once when we were very young, we were sitting in church and a little fuzzy went drifting in front of us. I’m not sure why we found it so funny, but we tried to stifle our giggles, while our mother and father gave us the disapproving look. I’m happy you and your sisters have such a wonderful relationship. Have a great weekend! Love this, Jill! I laughed out loud when my friend’s eighteen-month old son grabbed her freshly laundered shirt, threw it around his neck like a boa, and pranced around the living room floor. Kids’ antics usually make me laugh. You’re right, L. Marie, watching children act silly is a great way to spark laughter. LOL! “A shampoodle!” Those are cute. Thanks for sharing. You have a great weekend too! Thanks for the post, Jill! I’m a firm believer in laughter and was telling someone just the other day that in the books I read, as well as the books I write, I NEED laughter. Life is difficult enough, and I need a good balance. I smiled when I read your first paragraph. Remembering the sound of the ice cream truck coming onto my street was of the joys of my childhood. One of the things I love is hearing from readers when something from one of my books makes them laugh (sometimes in places I don’t expect). :) Blessings! My pleasure, JoAnn! Funny, initially I had my final question as “Do you like humor in the books that you read?” I’m with you! 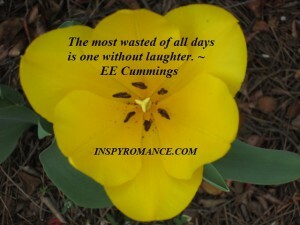 The more laughter we can get, whether in books or from those around us, the better. I hope your weekend is full of laughter, my friend. My sister and I must have read the same study. We tried to laugh for ten minutes straight (which was pretty funny all by itself, frankly) and then decided a good brisk walk would be easier after all! Here’s a little video that shows the power of laughter. If we laugh, the world laughs with us! They may think we’re crazy, but they’ll still join in. Laughing for ten minutes straight would be tough, Val…unless of course, you’re watching some of our silly Presidential debates. Great video! Thanks so much for sharing. Have a great weekend! This past weekend, my niece and her family came for a visit. I had lots of good laughs with my almost 2 year old great-nephew and his 6 year old brother! Oh, I bet the children provided a lot of great laughs. Those are entertaining ages! I remember my nephew liked to stand up in front of the family and pretend he was making a speech. He was only 4 years-old at the time…so cute. Have a great weekend, Margaret. Thanks for stopping by! My kids (6 kids, ages 13 years down to 1 year) make me laugh all the time! We all spend a lot of time watching the 1 year old and laughing. She’s a major cut up and loves having attention. As soon as she realizes people are watching her, she starts hamming it up. I also love the conversations I overhear them having and some of the things they come tell me have me rolling. I have a note on my phone where I “write” down all the funny things they’ve said or done so I can show them when they get older. Six children…wow! You’ve got your hand full! love that you’re documenting the hilarity for your children, Julie. I’m sure they’ll really appreciate when they’re older, Have a great weekend and thanks so much for stopping by and sharing with us. Jill, thanks for a fun-filled post. I love to listen to my two granddaughters laugh. It is such a precious sound. The little 4-year-old laughs and laughs when she beats her grandpa at UNO. My hubby and I always have a good laugh when we try to use the GPS in his car. The voice recognition feature is terrible. We were going to someone’s house about 15 miles away and tried to put in the address by saying it because you can’t input data manually when you are driving (good thing). Anyway we said the address, and we were promptly routed cross country from AZ to CT. First we yelled at the GPS, and then we laughed and laughed. My pleasure, Merrillee. I’m curious, have you ever recorded your granddaughters laugh? I have an old answering machine cassette of my nieces and nephew calling my parent’s house and asking if they can come over. It’s hilarious! Whenever they come to visit we play it for them and soon the room is full of laughter. As for the GPS, I feel your pain, that’s why I prefer an old-fashioned map. Have a great weekend! A man with a sense of humor was near the top of my list when it came to my future husband many MANY moons ago. The Lord gave me exactly what I needed, although sometimes I roll my eyes as I laugh. Still laughing 29 years later. I remember that from a previous comment you made on another post, Deb, A sense of humor is so important in a relationship and the occasional eye roll is okay. Keep laughing, my friend and enjoy your weekend. Thanks, Narelle! I agree, those romantic comedies are the best. Have a great week!